to Blocktoberfest downtown thrown by Block 15 brewery. We watched a few ski videos before heading over downtown with Kevin so we had a few beers in us before we even left. 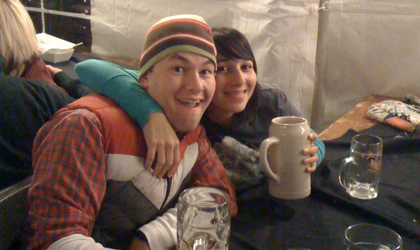 When we got to Blocktoberfest we received a very cool glass mug for the beer and immediately began to fill up. There was a very cool band there and we met up with Evan, Lisa, and Heather in the tent. door and I was trying to fix that too! The funniest part of the night was that Emily and the girls were out for a “girls night” and they ended up dancing upstairs at the Peacock. When us boys showed up at the peacock the girls were blitzed and Alexa was even mad at Kevin for going to the same place, but we didn’t even know that’s where they were! Apparently Emily and I made out for a while in front of people and according to Alexa we were almost asked to leave! haha! That doesn’t really sound like us though so I think that part was completely made up. In any case Emily got home before I did and apparently Kevin had to order food for me at LaConga. Chris and I battled each other the whole way home on our bikes!